Commonwealth Painting Company, Inc., was established in 1980 by Bill Rose, who still owns and operates it. Bill studied Fine Art at Parsons College, and Sculpture at the Corcoran School of Art in Washington D.C. A dedication to visual arts has given Bill a background for historic home preservation work; he has embarked on a lifetime independent study of architecture and has accumulated invaluable knowledge of architectural styles and design. Since his first project at 29th and E. Grace Streets in Richmond, Commonwealth Painting Company, Inc., has completed more projects in historic Church Hill than any other contracting service! Commonwealth Painting Company, Inc., is a member of the PDCA (Painting and Decorating Contractors of America) and subscribes to their “Code of Ethics” and professional practices. Commonwealth Painting Company has been certified in the removal and disposal of lead-based paints. 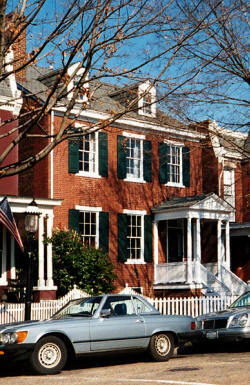 Commonwealth Painting Company, Inc., provides superb expertise in painting and restoration. Each employee is an experienced craftsman who is, in turn, supervised by a seasoned professional. Commonwealth Painting Company, Inc., is proud of its reputation in the community and publishes Testimonial Letters and photos of Completed Projects for your inspection. Don’t trust your “Classic American Home” to anyone but Bill Rose and his team of professionals at Commonwealth Painting Company! Commonwealth Painting of Richmond, Virginia (VA) is a residential painting contractor servicing the greater Richmond metro area. Commonwealth specializes in interior/exterior house painting, restoration painting, historic home preservation, molding repair and replacement, and drywall and plaster repair. Our professional, experienced crews focus on that unique look for your home.